The Vamps are a British pop rock band consisting of members Bradley Simpson (lead vocals and rhythm guitar), James McVey (vocals and lead guitar), Connor Ball (vocals and bass guitar) and Tristan Evans (vocals and drums). 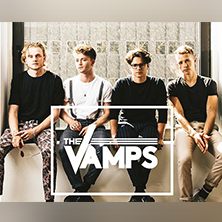 Eventim is the place to find The Vamps tickets and tour dates. To be the first to hear when more The Vamps tickets go on sale you can sign up to the Eventim Ticket Alarm below.